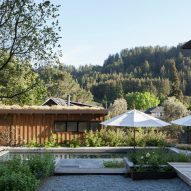 American studio Feldman Architecture has renovated and expanded a cottage just outside of San Francisco, adding a two-storey extension, a pool terrace and a garage blanketed with a green roof. 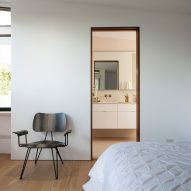 The project, called The Shack, is located on a wooded property in Marin County, which is connected to San Francisco by the Golden Gate Bridge. 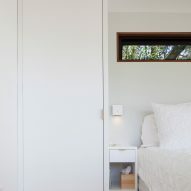 The holiday home serves as a nature retreat for a busy urban couple – prominent photographer Catherine Wagner and designer Loretta Gargan, both of whom were actively involved in the design process. The original, low-lying home felt dark and cramped. 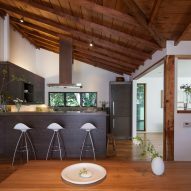 The team set out to enlarge the dwelling and open up views to the scenic terrain, in addition to enhancing the cottage's inherent character. "The home held the potential for beautiful mountain views, and if one looked carefully, hints of character and charm emerged," said Feldman Architecture, a firm based in San Francisco. The project was carried out in two stages. In the first phase, the team focused on the existing one-storey building. 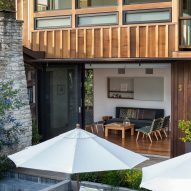 On the exterior, original siding made of old-growth redwood was retained. Inside, the home's sloped ceiling was opened up, revealing a rich-hued Douglas fir ceiling. Due to limited space, cabinetry in the kitchen was planned down to the smallest detail, "much like a ship's galley". In the dining area, an original fireplace made of Sonoma stone was retained and serves as a focal point. The fireplace mantel, along with doors and flooring, are made of reclaimed local wood. 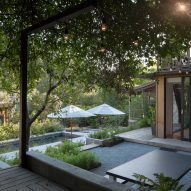 "These woods warm the interiors and complement views to the gardens and Mount Baldy beyond," the team said. 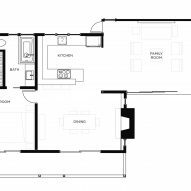 For the second phase, the team created a two-storey addition, which contains a family room on the ground level and a master suite up above. The rectilinear volume is topped with a sloped roof, which shelters a small balcony. 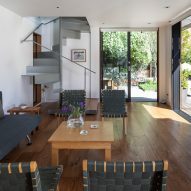 On the ground level of the extension, sliding glass doors open onto a landscaped terrace, which steps down to a slender swimming pool and jacuzzi. 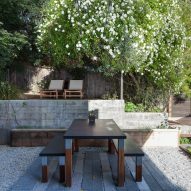 A diverse mix of plantings create a verdant setting in the backyard. In the back portion of the property, the team added a wood-clad garage with a green roof. The materials chosen for the new structures were influenced by the original home. 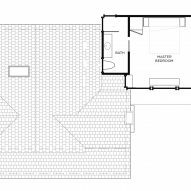 "The addition and garage are primarily made of materials similar to the original house, with board-and batten-siding in a natural stain," the studio said. 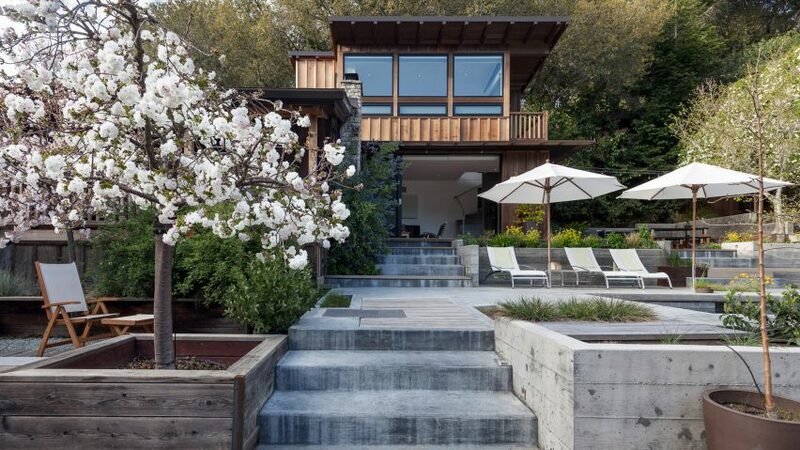 Feldman Architecture has designed numerous residential projects in California, many of which are situated in picturesque settings. Others include a house near the ocean with walls made of rammed earth and glass, and a pair of wooden studio buildings that are perched on a forested hillside. Photography is by Phil Bond.